About 400m south-east of the flagstaff tower lies the Chauburji-Masjid, a double-storeyed structure with a central chamber surrounded by a small chamber on each side. It derives its name, meaning the 'mosque with four towers’; from its original four domes. It was built by Feroze Shah Tughluq, evidently as a mausoleum. There is a 'minhrab' or prayer niche, in the west wall of the western chamber. The upper storey of the mosque is occupied by a domed chamber on the southwest corner. It was repaired and altered in the late Mughal times. Another surviving part of his palace situated over here is Pir-Ghaib. 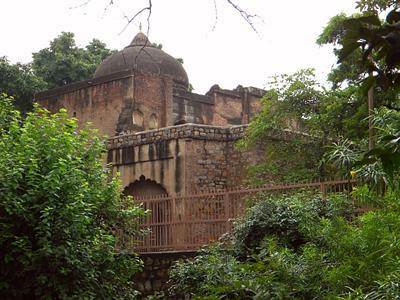 This mosque is close to Chaubrja Gate of DDA Park at Kamla Nehru Ridge on northern ridge.